Seed bead flowers are a more challenging beading craft that is worth the effort. Originating in France hundreds of years ago, seed bead flowers were originally made for home decor as replacements for natural flowers. However, when used in beaded jewelry fashions, the seed bead flowers add a lovely natural-looking jewel to your wardrobe. Using beading wire, seed bead designs can be molded into many species of flowers from daisies to daffodils. Learn how to create a basic beaded flower shape that can be adapted in many ways. Pull out a long length of the narrow-gauge beading wire from the spool and straighten it most of the way. Cut the wire from the spool, being sure to leave a few feet of wire to complete the entire seed bead flower. The wire can be either gold or silver colored, depending on your tastes and the finished color of the flower. As a general rule, use silver wire with cool colors such as blue, and gold with hot colors like red. Thread approximately seven seed beads onto the floral wire. This is the center row of your flower petal, and the number of beads should be determined by the desired finished size of the flower itself. Thread the same number of beads onto the other end of the wire and push these two rows of seed beads down till they are together. 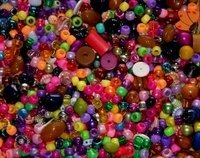 Leave approximately two inches of wire loop below the two rows of beads. Grasp both wire sides directly below the two rows of beads and twist it together securely. Continue twisting the wire together until it forms a stalk or stem. This will be the stem for the flower petal and will be used to connect it to the other flower petals to form the flower. Twist the two open ends of the wire together securely, just above the two rows of beads. Then, choose one of the wires and thread several seed beads onto it. There should be a few more beads here than in the initial rows as they must reach the bottom and create a pleasant rounded shape. Bring this beaded wire down to the stem side of the flower petal. Wrap the beading wire around the stem wire two times, directly below the initial rows of beads. Be sure the petal rows are positioned tightly together. Thread the same number of beads onto the wire again and bring it up the other side of the beaded flower petal. Be sure to use the same number of beads on each side of the petal. Twist the wire around the top in the same way as you did the bottom. Repeat these steps, alternating wires, until the petal reaches its desired size. Create as many petals as your flower requires. A standard, beginner's flower can have five petals. When all petals are complete, gather the wire stems of all the petals together and twist them together tightly. Use pliers if necessary. Arrange the flower petals so they look natural. If desired, a large bead or a twisted wire with seed beads on it can be used for the flower center. Use green floral tape to wrap the entire flower stem securely. Continue wrapping directly under the spread flower petals, making this part of the stem slightly wider than the rest. For inspiration, look at a real flower and how the green extends under the petals. Use your finished flower as a craft decoration, on a brooch or fashionable pin, or attach it to a hair clip for a beautiful hair accessory. Make leaves from green seed beads to go with the flowers. Take care not to crimp wire or create harsh bends as this may weaken it.